Here's another example of how companies turn DVRs into their friends (remeber KFC's hidden coupon?) 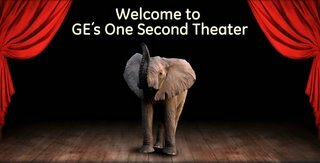 At the end of the usual TV spots, GE inserts a one-second bonus that consists of thirty frames viewable in slo-mo or in the frame-by-frame mode. You can watch the commercials and extra material at GE's website. They have also created MySpace profiles for the spots' characters (here's one for Elli the Elephant, created on May 2).